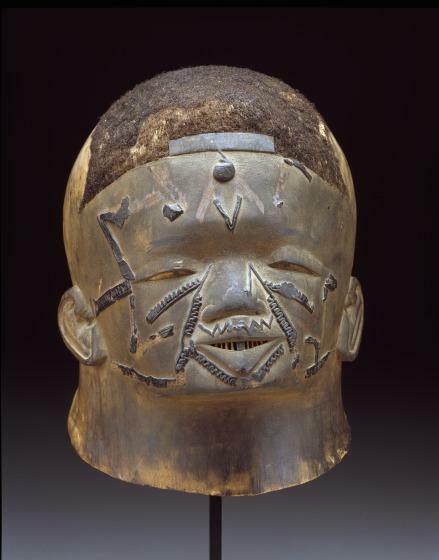 This helmet mask appeared in the men’s lipiko, a public masquerade that was still being staged in the 1990s to celebrate the reentry of Makonde males and females into the community after they completed the coming-of-age rituals in their respective bush schools. Boys and girls were initiated into adulthood according to African convention, which includes three stages: separation from the community and one’s mother, preparation for adult life, and reentry into the community as an adult. In the seclusion of the forest encampment, boys learned discipline and the rules of accepted social behavior and developed skills to support their future families (e.g., farming, hunting, fishing). They learned the songs and dances they would have to perform and gained understanding of their sexuality and the obligations of marriage and family life. Before completing this stage, both boys and girls were subjected to surgical procedures, circumcision for males and excision for females, and had their faces and/or bodies decorated with scarification patterns. Their teeth were chipped into points. These were painful tests to prove one’s manhood or to become more attractive. During the second stage, boys also learned about death and the secret of masking. They had been taught to believe that the humanlike beings (the masks) came from the world of the dead. Now, in a frightful rite, they came in close contact with the mask, which was dramatically removed from the wearer. The boys discovered it was made of wood and to drive home this fact, a sculptor carved one in their presence. They also learned how to wear the muti wa lipiko (head of the lipiko) to allow air to circulate through the neck end of the mask so as not to suffocate, to attach the cloth to the mask so it draped over the shoulders, and to wear the body-concealing costume and tutulike overskirt. The mystery of masking was not revealed to the girls and uninitiated males because masking was a form of social control. The final stage was a public masquerade in honor of the new adults. Makonde sculptors faithfully depicted the filed teeth and facial scarification of the villagers on the masks. The Dallas mask probably represents a male, as indicated by the absence of a lip plug. It is reputed to have entered a German collection before 1914. The application of smoked beeswax to create the scarification patterns reflects a Makonde practice that was current in the early part of the 20th century. Roslyn A. Walker, The Arts of Africa at the Dallas Museum of Art (New Haven and London: Yale University Press, 2009), 128.